You've got to start somewhere and for Sue Van Nattan of Bearlooms, that somewhere was on vacation in Florida in 1993. Her daughter was about to enter her first year of high school so Sue and her family decided to take a trip. "While there, we visited a friend who had been collecting teddy bears for a year and already had more than 200 in her collection. I had never heard the term, "artist bear," but those were the ones I was immediately drawn to. I loved the detail and unique look that each artist gave her creation." When they came home to Carlinville, Illinois, her husband encouraged her to create bears of her own. "Just one; I swear that was all I was going to do!" Since then, for years, her investments went towards "mohair instead of stocks and bonds" and became a part of her life. 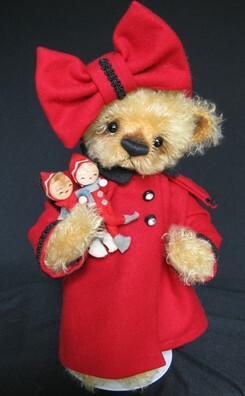 Sue feels that she is blessed that, for the last 20 years of creating bears, she's had constant support from family and friends who enjoy her hobby of creating "furry heart-stealers" that she decorates with vintage and antique accessories to brighten her bears. After 27 years of working as a designer in a flower shop, Sue and her retired husband, Jim, were invited to open a booth at a new antique mall, that she encourages everyone to come and visit. As she goes "treasure hunting", Sue comes across new ways to enhance her bears and finds inspiration in antique things. Her addiction to vintage Steiff and Schuco animals has led her to not only sell them in her shop, but combine them with one of her own creations, something she says collectors enjoy as they're getting two new friends at once. Her favorite part of belonging in the artist community is participating in shows for collectors. "My first show was a Bright Star Promotions' teddy bear in St. Louis, MO and numerous other USA shows." "These shows have given my hubby and me the opportunity to travel to places we would never have seen otherwise, and best of all we've made lifelong friends among collectors, artists and their spouses." 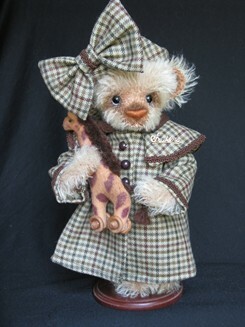 Sue has won multiple awards over the years, including Golden Teddy and TOBY awards, winning a Best-in-Show for her bear "Long John Silver," who now resides in the Susan Qinlan Doll and Teddy Bear Museum in Santa Barbara, California. 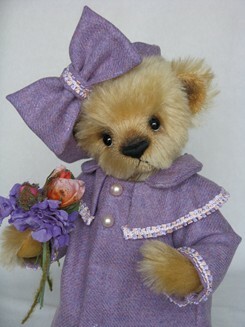 She has made appearances in numerous issues of various teddy bear magazines, as well. Teddy bears have even brought her "screaming and kicking at first" into showcasing her bears using computer technology. She's taken part in online teddy bear shows; excited to show her bears to collectors who live far away or who may not be able to attend a regular show. "As much as I miss meeting collectors and seeing their reaction to my "kids," it's good to know that collectors are able to shop from home." The collectors are as much of a pleasure virtually as they are in person and she's made many new friends this way also. Sue prides herself on her bears never being "assembly line" pieces. "Each one is a unique little soul that brings me joy upon completion." And although she has intentions to finish some other non-bear related projects, "the bears just keep calling me!" Sue exclaims, "So I'll keep making them. There seems to be an unending supply of gorgeous mohair, alpaca and European plush out there, and I need it all!" She remains excited and loving her work because there's always so much to explore and to create. Where is Carlinville, Illinois USA? Learn more - click on the map.